Posted on Mon, Mar 26, 2012 : 5:39 p.m.
Michigan State University is inspecting windows across campus after an 18-year-old high school student from Ann Arbor fell through the glass in a sixth-story dormitory lounge early Sunday, MLive reports. The window through which Alexandra Pew fell was boarded up Sunday. It was replaced Monday, MLive reported. Alexandra Pew, of Ann Arbor, was playing catch with friends in the lounge at North Case Hall about 3 a.m. when she fell, MSU police said. Pew, a senior at Greenhills High School in Ann Arbor, was visiting friends at the university for the weekend, MSU police Sgt. Florene McGlothian-Taylor said. She was listed in critical but stable condition at Sparrow Hospital in Lansing, MLive reported. The broken window was replaced Monday but the lounge remains closed. MSU Physical Plant inspectors found the window frame Pew fell through to be structurally sound, MSU spokesman Kent Cassella said. Dormitory management was inspecting all study lounge windows in Case Hall Monday, MLive reported. Cassella said the inspection would be completed by the end of the day. 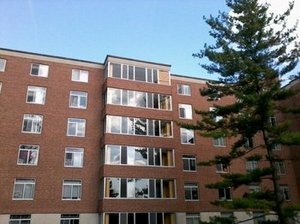 Engineers from the MSU Physical Plant are also set to inspect all residence hall windows by the end of the summer. Meanwhile, Pew, known to her friends as Lexi, is expected to recover, said Peter Fayroian, head of Greenhills School. He said Pew’s parents expressed their relief that she was not more seriously injured. “We expect her to walk at graduation," he said. Fri, Mar 30, 2012 : 12:10 a.m.
Makes perfect sense for a study lounge window to be the kind that cannot be opened. I would think that most of the other rooms in a dormitory would be the kind that can be opened. But it's the window frames that are being examined as a result of this fall. Wed, Mar 28, 2012 : 6:23 a.m.
Next for MSU students: playing catch on the roof of Sparrow Hall. Let no record fall remain unchallenged. Tue, Mar 27, 2012 : 1:34 p.m.
Glad she's doing well. Just goes to show that when your parents tell you not to throw the ball indoors they just might know what they're talking about. Tue, Mar 27, 2012 : 1:03 a.m. I am so glad she id doing okay.